LONDON (Reuters) - Global emissions of carbon dioxide (CO2) from the energy sector were flat in 2015, despite an uptick in economic growth, the IEA said on Wednesday. The energy sector is the largest source of man-made greenhouse gas emissions and traditionally its emissions have only fallen or stayed flat during economic downturns. 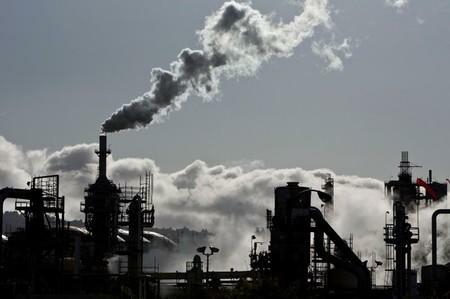 Global energy CO2 emissions were almost unchanged at 32.1 billion tons last year, preliminary data from the International Energy Agency (IEA) showed, while the global economy grew by more than 3 percent. "The new figures confirm last year's surprising but welcome news: we now have seen two straight years of greenhouse gas emissions decoupling from economic growth," IEA Executive Director Fatih Birol said in a statement. The halt in energy emissions growth came largely on the back of a surge in renewable power production which accounted for around 90 percent of all new generation capacity in 2015, the report said. "Coming just a few months after the landmark (climate) agreement in Paris, this is yet another boost to the global fight against climate change," Birol said. Last December more than 190 countries agreed in Paris to a global climate pact designed to curb the rise in temperatures to "well below" 2 degrees Celsius above pre-industrial levels, a mark scientists fear could be a tipping point for the climate. The IEA has been collating energy emissions data for more than 40 years and said during this time there have previously only been four periods where emissions fell or were flat and three of were associated with economic weakness. More detailed analysis would be provided in the IEA's World Energy Outlook special report on energy and air quality released at the end of June, it said.